Being on a hunt for the best adjustable weight bench is not easy. There are hundreds of available benches out there, so which one should you get? We have reviewed tens of bench and now, we present you Bonnlo upgraded adjustable weight bench and everything this beauty is capable of. Bonnlo makes basically everything, from fitness equipment to pet gates to TV cabinets to kitchen sink. But right now, we do not care about any of that. What we care about is the Bonnlo upgraded bench. So let’s jump right into the features. The frame of the bench is made of durable steel and its powder-coated. The pads come with comfortable padding and high-density upholstery for better body support. The entire bench is supposed to hold up to 660 pounds of total weight. The bench has two pads, a back-pad, which has 6 different adjustable positions (inclined, declined and flat) and seat-pad, with 3 adjustable positions. The uncommon addition are the two elastic strings for arms exercises, that are included for free. The assembled dimensions (flat position) are 57 x 13.4 x 17″ (144.8 x 34 x 43.2 cm) and the weight is 36 pounds (16.3 kg). The Bonnlo upgraded adjustable weight bench comes mostly pre-assembled. All you have to do is to align the necessary holes properly and tighten the nuts. It should not take you more than 30 minutes. Once assembled, you can try the 6 different back-pad positions. It has a 20° decline position, a flat position and 4 incline positions (90° ,60° ,45° ,30°). This is pretty good and should cover all your exercises. Now the mechanism to adjust different positions is really tight. Since the bench is quite lightweight, you should either sit on it or hold it with a leg when switching positions. The bench itself is pretty stable, does not really wobble under my weight of 160 lbs, although it would be quite weird if it did, right? Although personally, I think the 660 lbs max weight support is a little far-fetched. 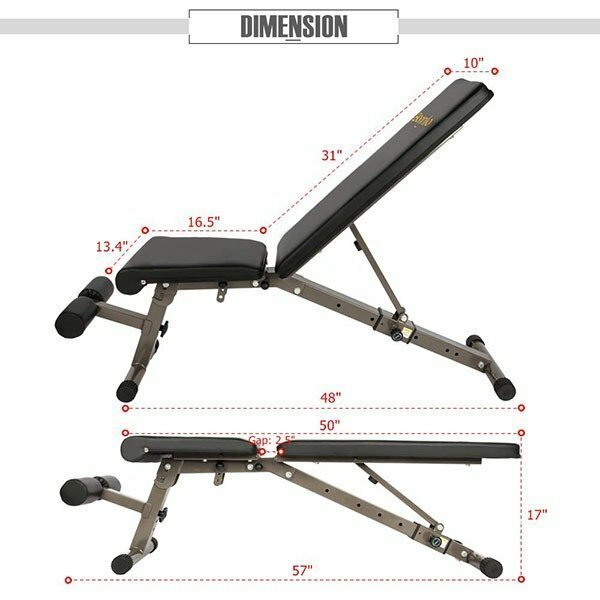 Regarding the sit-pad, the Bonnlo upgraded adjustable weight bench has it all right here, it is quite comfortable but a little strangely designed. The most outer part of the sit-pad is not steel-supported, so I would advise not to sit only on that part. But in regard to comfort, the padding and upholstery does the job. The included strings are made of cheaper materials, but they do the job. Last but not least, the rubber caps at the base could be a little tighter, as they might fall of when you are moving the bench too often. But that’s a minor con. If you do not mind the mentioned cons, then the bench is worth trying. It is stable with solid construction and quite comfortable, not to mention that It’s quite affordable. 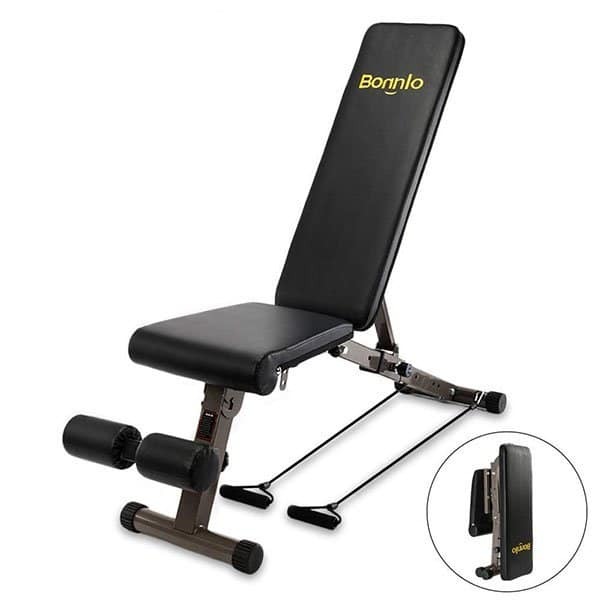 If the dimensions are good enough for you, then I’d say go the Bonnlo upgraded adjustable weight bench is worth the money. 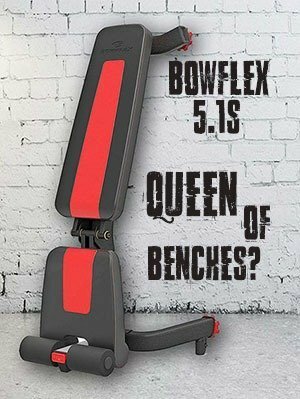 Make sure to also check our Bowflex 5.1s review.